ELACTA releases her informative magazine in 2 ways: either in the English digital version (in pdf) or in the German paper version. ELACTA members get the digital version for free. For non-members , it is possible to subscribe for our digital magazine Lactation and Breastfeeding by adding this product to the cart. After the first payment via the website, you will get a pdf in your mailbox 4 times yearly. Subscriptions are automatically renewed, you will get an succesive invoice by mail. Cancellation condition: cancellation in writing to magazine@elacta.eu, after you paid your outstanding dues. 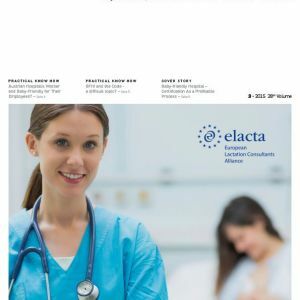 The yearly subscription for Lactation and Breastfeeding of ELACTA is a quaterly magazine in PDF. It contains scientific articles, research , information about Lactation issues in European countries, ELACTA activities, cases, reports and other information about Lactation and Breastfeeding.